Dr. Cherie Buisson is a 2000 graduate of Mississippi State University. She owns Helping Hands Pet Hospice in Seminole, FL. 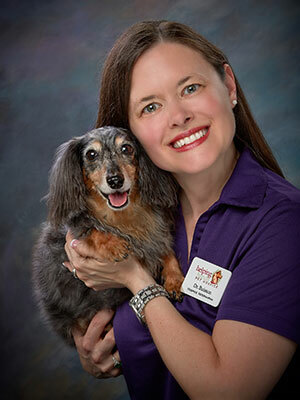 She is also the founder of A Happy Vet, a website dedicated to improving quality of life for veterinary professionals. She is a featured author for DrAndyRoark.com. Her lectures on euthanasia, hospice care and finding happiness in veterinary medicine have reached veterinary teams around the country. Compassion fatigue presents a very real threat to veterinary medicine. It affects individuals, organizations and the profession as a whole. Veterinarians have risen to the top of the list of professionals likely to commit suicide. Pressure in the profession is worse than ever with social media providing a platform for bullying, rumor mongering and misinformation. Unrealistic expectations of perfection from inside and outside the profession contribute to this stress. In this workshop, we will define compassion fatigue (there are still people who suffer from it and don't know what it is!) and compassion satisfaction. We will learn its root cause (it's not what you think!!) and aggravating factors. We will discuss the uniqueness of veterinary compassion fatigue and ways to ease the burden of euthanasia. Confidential self-testing will enlighten us as to whether we are at risk and make us more able to identify the warning signs before they develop into a crisis. We will review different personality types in veterinary medicine and how they shape an organization’s risk for compassion fatigue. We will go over what to do when you suspect an employee or colleague has compassion fatigue and how to gently address the issue. Most importantly, we will learn what tools we need to achieve and maintain compassion satisfaction. Because this workshop is likely to be attended by sufferers of compassion fatigue, it is designed to be stress-free. No forced audience participation or group activities will occur – this is not group therapy! This will be a safe place to talk about compassion fatigue in our profession or just listen and absorb without pressure. The goal is to give each attendee a practical guide to enjoying their professional life and avoiding burnout.